In total, there are over 470 creature stat blocks in this book at the Dungeon Master's disposal! 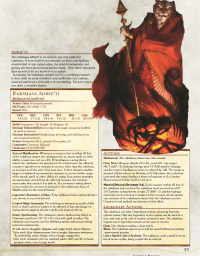 Have you burned through the monsters in your Monster Manual yet? Are you playing with *that guy* who knows what all the monsters will do and when? Even the more obscure ones? Well, a new D&D supplement has been created with you in mind. It is the “Monster Manual Expanded” Edition and it provides & expands of the current monsters with plenty of variants. Have you have ever wanted to create a culture behind the mobs, expand on the undead theme in your campaign without 10,000 plain vanilla skeletons, develop a ‘mob town’ to have some real variety yet struggle to come up with well thought out stat blocks. This book is a real charm. It is 336 pages long and jam packed filled with over 470 stat blocks. You no longer have to insert a ‘skeleton’ here there and everywhere but rather there are 11 different skeletons [Different stat blocks] to choose from with different ranks [from CR 1/8 to CR...See more 5]. Its not just the ‘filler’ mobs between boss encounters either. 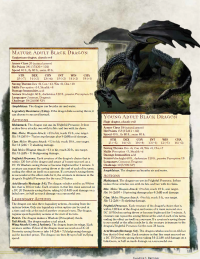 The ‘boss’ mobs have also had the “Dragonix” treatment again providing you with a wealth of new monsters just itching to be unleashed on your party. I DM enough veteran players to know that crafting encounters with this tome will be a pleasure. It will present old favourites with new twists that are neither too trivial nor too hard. With the added benefit of them being variants so not as predictable either. I can see this book waking some of them up a bit from approaching that kobold fight to paying that bit more attention due to the unexpected happening. As I said earlier but bears repeating is this: that the few stat blocks I have placed side by side and the others that I have read and had a ‘gut’ feeling about, I think they seem very well balanced. I am very excited about trying these out. Kudos to the content creator Dragonix for such a fine volume. Excellent product, thank you! I did notice a typo on page 6, 1st paragraph, last line - "Baelnoroth" should be spelled "Baernoloth". It does appear to be spelled correctly everywhere else. I know this is a type I and I swear i am not making fun of that, but Animated Brood Queen sounds amazingly terrifying under the Ankheg heading. Is there a way to contact you directly please? haha good catch. it was artifact from the animated statue. fixing that in the next version. I have a question regarding the use of stats blocks from that book : would you allow me (or others) to copy some of your stats blocks (4 in my case) to be printed in an adventure which I will sell at the DMsguild ? You will be credited in the credits and under every stats block reprinted in my adventure. Hi Corentin! First of all, thank you! As for your request, I would have to, unfortunately, politely decline. I don't want to sound selfish, but the stat blocks are the selling points of the book. It might set a precedent that if I allow 1-4 stat blocks to be shared, it might encourage others to just keep copying the stat blocks, with no limit. What you can do is refer to the creature's name, the page number, and the book (even provide the direct link to the DMG page if you wish). You can even provide a brief description/explanation as to why the creature fits in the adventure. And then provide an alternative MM creature if the reader doesn't want to. I hope that helps. Actually, per the license for DM's Guild products, other creators can and most likely will use your stat blocks in their own creations here on the guild. 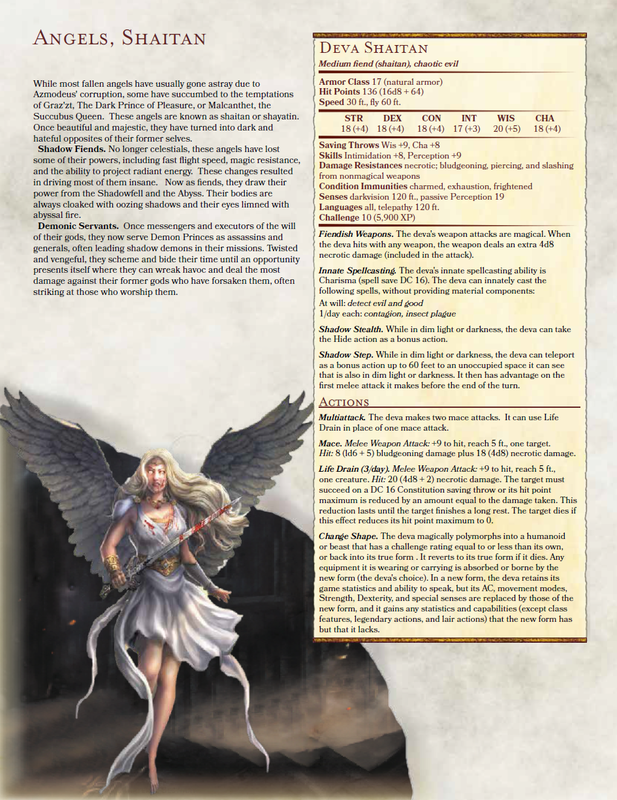 "When re-using a larger element that you have taken from another DMs Guild author’s work, include a reference to the original work by linking to the product page on DMsGuild.com within your PDF. For example, if you are using a Rainbow Unicorn creature that you found in another author’s work, you might reference that inside your own work where you provide stats for the Rainbow Unicorn the first time, using an internal citation such as, "(Rainbow Unicorn from Cloud Forest by Jane Doe)."" Attributions are not even required, but it is in the best interests of all creators to do that so that we all get the value. Obviously reprinting the entire book would not be allowed, but a selection of stat blocks reprinted for an adventure is absolutely allowed per the license. Thank you for clarifying Tyler. However, I think it's still a bit vague. No limit has been specified. What's stopping someone from using half of the stat blocks you create, putting them all in adventure, and selling it for just $1.99? Hi Corentin, after clarifying with the guild, you are free to use the content. You can use the information in the stat blocks that you need. Please recreate them though and not just copy paste it and use it as an image. Is that ok? I'm really sorry to learn that rule about DMsGuild, I didn't knew about it at all. I assure you I will only pick a few monsters I really wanted to use and you will be credited everywhere for it. I will copy the stats but "only" the text. And I can assure you I will provide a complete mini campaign and not just your stats blocks with a 3 pages-adventures, for what it's worth. Nothing to apologize about Corentin. Hope you can give me a heads up when you release. Good luck! Thanks, I will inform you of course. Hey don't be sorry Corentin. Dragonix published on the Guild. They could have used DTRPG where they could have done so with a completely different license. But, they benefited hugely from using the Guild's artwork as part of their book, so this re-sharing is the trade-off. - Enhanced graphical layouts, a few new creature artworks. Fantastic product. I would also like to see a print version in my library. Maths are off for all Mind Flayer monster variants in the Tentacles attack. The random damage shows 2d10+4 but the average shows 5. I think the average was likely meant to be 15, in this case. Edit: Removed a comment about Drow since that section has been revised/updated. But thank you for catching the typo in the tentacle attack damage. I'll have that fixed by 1.05. Expect that version to be uploaded by the end of the week, which should come with improved artwork layout and some new monster images. Yep, I noticed that after I'd hit enter. I was happy to make that edit. I'll definitely be checking back for new versions as they get released. Really liking the work so far. It will happen, Gordon! Not soon, but it will. Found another typo - the Eye of Flame is labeled as Elder Orb. Thanks Thomas! Fixed now. Will reflect in the next update. Perhaps it could be the device on which I’m viewing the PDF, but there appears to be no page numbers in the table of contents. Hi Nick. You're not wrong. Currently, there are no page numbers. I will add those in a later update, when I am sure I will no longer add any new pages. For now, it just serves as an outline of what you can expect inside the book. 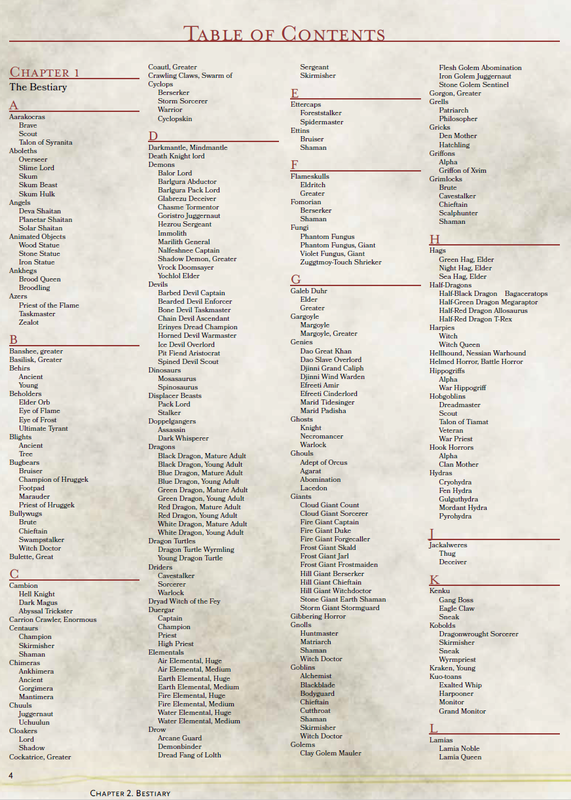 But the PDF does have a bookmark with links to every statblock. 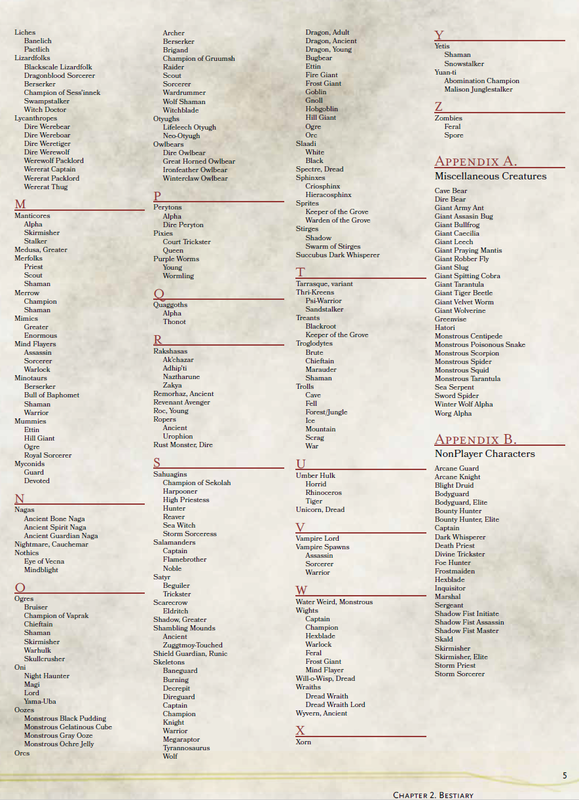 Not entirely sure why, but the elementals are in the middle of the D section of the table of contents, between Duergar and Drow. I have no idea as well :P. Thanks for catching it, Isaac. It'll be fixed in the next update. Version 1.03 is now out! 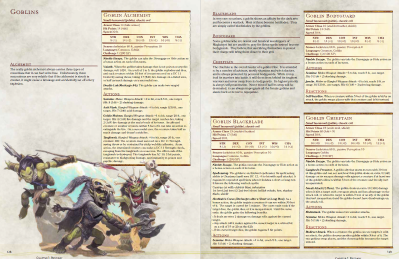 Any chance you'd do a spreadsheet listing for Kobold Fight Club? That would make the book even more useful. I'd also be interested in a paperbound or hardback version. 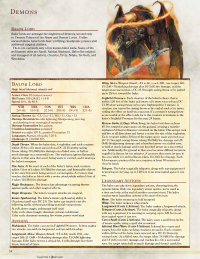 As for the Kobold Fight Club, I'll look into it. Right now I'm a little busy catching up with my day job and also planning out the next book and improving the current one with my artists. But we'll see. As for the paper/hardbound, I am also looking into that, but it will take a bit more time. 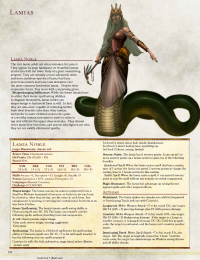 Like I said, I'm still improving Monster Manual Expanded. I found a new artist and he'll be working on providing me with additional artwork for the monsters that currently have no graphic representations. I'll keep everyone posted when that day comes! This title was added to our catalog on February 25, 2019.